This topic contains 0 replies, has 1 voice, and was last updated by Locohacker 1 year, 2 months ago. This are directions I followed around the internet to install VB6 on Windows 10. 2- You got to edit the file SETUPWIZ.INI which you will find in the the installation folder because VB6 setup will try to install the old Java so to stop this you need to use notepad or what ever editor you use and delete ie4\msjavx86.exe from the line VmPath=ie4\msjavx86.exe it should look like this. 3- Now you need to go back to the setup folder and make sure you that the setup.exe is run under the old Windows XP like this right click SETUP.EXE choose Properties. 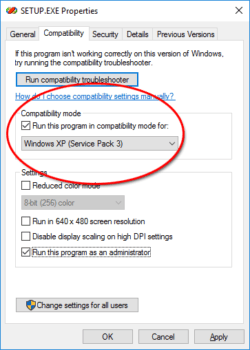 Select the Compatibility tab and check to box Run this program in compatibility mode for: and set the value to Windows XP (Service Pack 3). Also make sure you check the box Run this program as an administrator and press the Apply button. 4- Now run the Setup as Administrator 🙂 and follow the directions. I like to use the VB6 Windows look without everything being together, so to change that click Tools than Options than Advance there check SDI Development Enviroment and restart V6 again.